So sorry for my lack of viewing and commenting lately I'll try to make up for it this week. I just took my husband and a friend to the airport this morning around 3 am. they're off to Cuba for a week and when they get back, 3 days later Grace and I are going on a 14 day cruise. so it has been a bit hectic lately. I've never seen birds fighting like that. 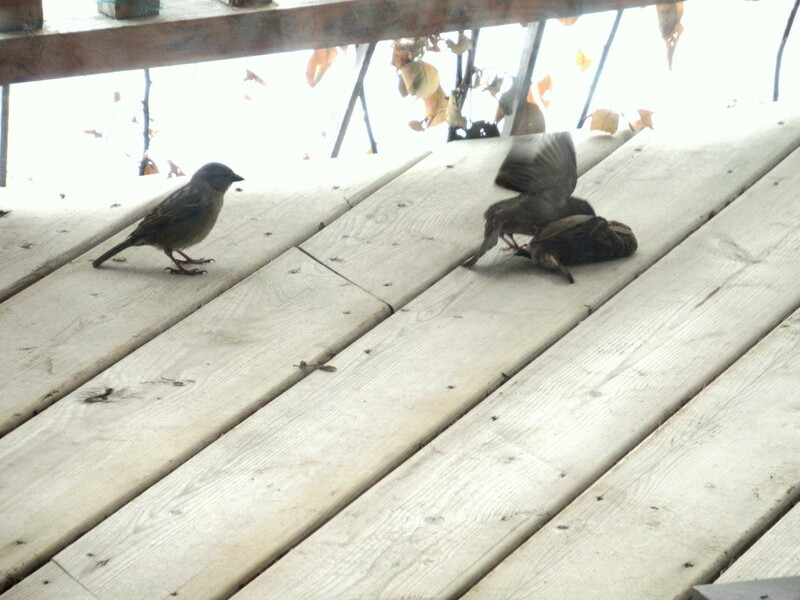 it happened on our deck. you see, we have a birdhouse on a post and the sparrows were already looking for a mate. there were two females fighting over the onlooker, the male. it went on for a long time. I think the defeated bird finally got free and took off. The picture is from March 14th. I often think they are more at a fithing came as eating on the bird feeder. Birds can indeed be vicious at times! They are really going at it!! Interesting. I thought I'd was usually the makes fighting over the female.